I first began to breed Birman's in 1980 and after breeding many of the colours now concentrate on seal and blue points only. We regularly attend cat shows here in Queensland and I am also the President to the Birman club in Queensland and Treasurer to the Semilong hair cat club also in Queensland. I have judged for many clubs here in Australia and also New Zealand from where I came in 1979 to settle in Australia. 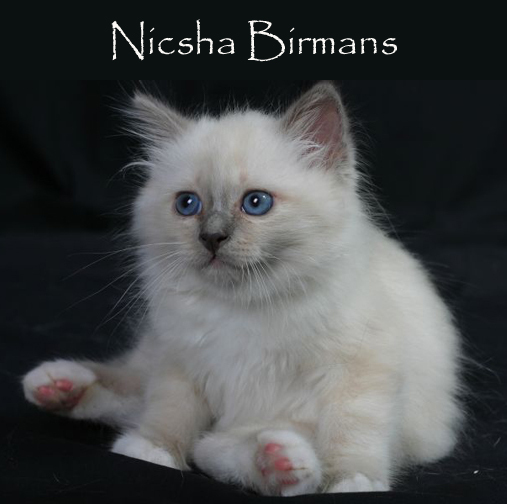 All inquiries for Birman kittens will be replied to and I will always be available to help new Birman owners with as much information as they require to be able to decide which is the most suitable kitten for them to purchase. We sometimes have older cats for sale. All of my kittens are given the very best care and attention within our home to ensure they are well adjusted so that they will adapt easily to their new home. I am happy to answer any questions you have and will be only too happy to make an appointment for you to view the parents.